Tri-colored bat caught in 2011 bat blitz. Tri-colored bats are tiny, smaller than little brown bats. Photo by Gary Peeples, courtesy of USFWS. On September 29, the U.S. 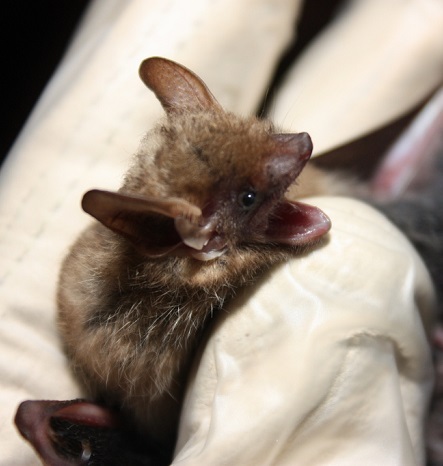 Fish and Wildlife Service (USFWS) announced $2.5 million in grants for research, management, and communication projects related to white-nose syndrome, the fungal disease that’s killed millions of North American bats since 2007, when it was first documented. White-nose syndrome is caused by a cold-loving fungus, Pseudogymnoascus destructans (Pd), that infects hibernating bats. In affected hibernacula, 78 to 100 percent of bat populations have died, more than 5.7 million bats in northeastern North America. As a major predator of defoliating forest and agricultural insects, bats are important to forests and forest health. The value of bats to the agricultural industry is estimated at $23 billion a year. Four U.S. Forest Service research studies received USFWS funding, including those at the Forest Service Northern Research Station, the Center for Mycology Research at the Forest Products Laboratory, and the Southern Research Station (SRS). SRS research ecologist Susan Loeb received a grant of $95,409 to increase the understanding of the vulnerability of tri-colored bats to white-nose syndrome in the South. Tri-colored bats (Perimyotis subflavus), formerly known as eastern pipistrelles, are one of seven North American bat species that have been confirmed with white-nose syndrome in various locations. Mortality rates for the small tri-colored bat, once common across the eastern U.S., are very high in areas where they’ve been infected with white-nose syndrome. Cave and mine temperatures in South Carolina and Georgia are optimal for the Pd fungus, and surveys in one hibernacula in Georgia found a 90 percent decline in tri-colored bats – from 5,000 individuals to 500 – two years after exposure to white-nose syndrome. Further, unlike other species affected by white-nose syndrome, the range of the tri-colored bat extends as far south as Florida and Texas where they are known to go into deep hibernation. This suggests that white-nose syndrome could spread throughout the southeastern U.S.
Winters in the South often include warm periods, and there’s been some assumption that the region’s bats come out of their hibernation torpor to forage on warm days, which could sustain them even if they were infected with white-nose syndrome. Loeb’s study will test this assumption on tri-colored bats to provide a better understanding of the vulnerability of bat species in the South. The study will also test whether the skin temperature of tri-colored bats during hibernation is within the optimal range for growth of Pd, thus making this species especially susceptible to white-nose syndrome. Data from this study will be used to predict the spread of white-nose syndrome across the South and will assist in designing more effective treatment applications. Read more about the Forest Service projects funded by USFWS.